CIFC encourages leadership, diplomacy, learning, cultural understanding, and stewardship of the environment with the goal of giving campers the tools they need to lead meaningful and successful lives resulting in positive impacts on their communities and the world. Canoe Island French Camp provides children and families with a superior camp experience through the study of language and cultures of francophone regions, traditional camp activities, and the investigation of the natural and cultural history of Canoe Island and the Salish Sea, all in a nurturing and beautiful natural environment. 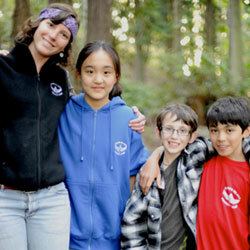 CIFC empowers campers to become their best selves and caring and committed members of both the San Juan Island community and the world. Canoe Island French Camp was founded in 1969 by the late Dr. Warren Austin and his wife, Heath (Bunny) Horton Austin when they could not find a French camp on the west coast for their daughter. First established for just a few weeks each summer on Orcas Island, the French Camp eventually moved to the Austin’s beautiful new facility on the 47-acre Canoe Island located just off the southern shore of Shaw Island. The Austins continued to play a vital role in the camp’s mission, program, finances and publicity until their deaths. Because of their vision, today’s youth have the opportunity to take part in this unique experience of living on a private island, learning about France, its language and culture while participating in all the fun of a classic Northwest summer camp. The blend of fine arts, performing arts, language, culture, sports, and outdoor activities melds the activities of mind, body and spirit into the best of a liberal arts education. 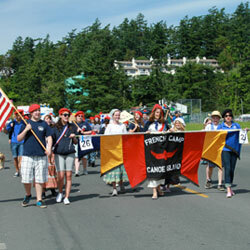 Canoe Island French Camp is accredited by the American Camp Association, and is a member of the Western Association of Independent Camps,which means it meets the highest standards of camp excellence.